It is well past my bedtime! And yet, I’ve still got at least an hour before I can get some partial shuteye. Somehow – somehow! 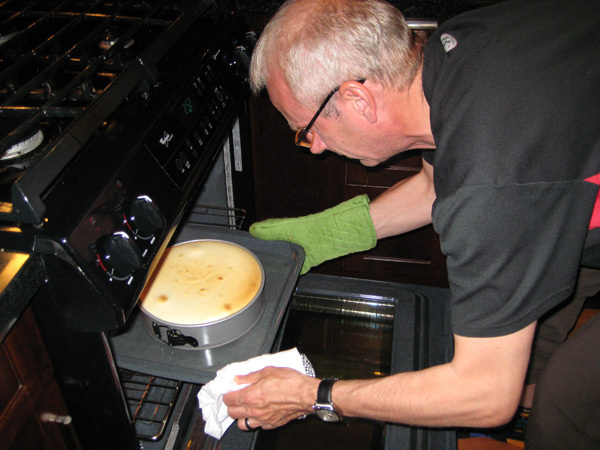 – I have found myself in a situation where I am baking a cheesecake at midnight! I don’t know how it happened, really I don’t. One minute I was watching a movie (Fish Tank = good but so very disturbing) and the next I’m mixing up the cream cheese and sugar and vanilla extract and heavy cream! Something must have possessed me … something that really does like the cheesecake, and that really did want to try out my new Junior’s Cheesecake recipe book. It just had to have been … good thing I heart cheesecake! So, a while back a fellow blogger lent me a book all about diabetes – Cheating Destiny by James S. Hirsch (a type 1 diabetic with a kid who also has type 1 diabetes) – and I’ll be honest, going into it I was totally freaked out. I’ve never been one to read about the trials and tribulations of diabetes, as I just never wanted to know. My whole life I’ve been bombarded with people telling me that because I have diabetes, I’m more susceptible to gangrene, and other circulatory issues, to kidney failure, heart disease, stroke, etc., etc. And that’s on top of the “every day” possibility of me going into a blood-sugar coma. And after more than two decades of being scared pooless of the possibilities, you start to do anything in your power to avoid hearing about them. I’m a pretty healthy diabetic; that’s what matters. But when Cheating Destiny was put in my hands, for some reason, I flipped it open. I’m still not sure why, maybe it’s because of the blog, maybe I thought it would be good fodder for you guys. But regardless, I am so glad I did. It was such an eye opener to the history of this disease and to what’s happening and what’s not happening with research and funding for diabetes. • Ok, so before insulin, diabetics were starved to stay alive … even if only briefly and I’m sure quite uncomfortably. Without a working pancreas and without synthetic insulin, food, namely carbs, but also proteins and fats, were essentially poison. • It wasn’t until the early 1980s that diabetics had access to glucometres. Most tested their blood sugars by tasting their urine for sweetness! Ewwww! Thank goodness, I was diagnosed a few years post glucometres! • Insulin, hailed as the “Miracle Cure” when first discovered, has pretty much screwed diabetics all around. Because the public viewed it as a cure, there hasn’t really been an urgency to fund research to find a real cure. Oh joy. • Governments spend all this money to try and fix diabetics when they become seriously ill with complications from the disease, but they tend to neglect the education of diabetes at the onset, which would probably ward off a huge amount of those complications in the first place. Hirsch told the story of this one family practitioner out of Florida who really took care of his patients (of which, 20 per cent were diabetics) educating them on the importance of simple things like clipping their toenails to prevent infection and making himself available when their blood sugars went awry. But after just a few years, he had to close up shop, because diabetes education and care didn’t pay the bills like reimbursements for kidney dialysis did. • And the worst thing of all, it’s pretty darn heartbreaking to read all about this, and to know that kids like Mario’s buddy’s kid who was diagnosed at four, and Hirsch’s kid who was diagnoses at three, are still getting this disease! I gotta say, this book kind of put a bit of a bug in my bonnet to actually care enough to want to find a cure, and if not for me, for all those little innocent kids that I once used to be. Little too heavy for me to remove with all that cheesy goodness! Off to sleep for two hours before having to get up and put the cake in the fridge, and then up again at 7:30 for yoga! Looks pretty good, hope you make it for us someday!!!! would love to read the book Katie.